State taxes and transfers can be an important form of assistance for low-income families. But the amount of government help varies widely among the states. And, importantly, so does what happens to those benefits when such a family increases its wages. To help understand how those tax and spending programs work, the Urban Institute has created a new interactive Net Income Change Calculator (NICC). The calculator allows users to enter information about family and work characteristics, child care expenses, rent, and program participation. The calculator then provides estimates for taxes and transfers at five income levels so users can see how taxes and transfers change as income rises. It includes state and federal income taxes, the employee share of payroll taxes, and a wide range of subsidy programs, including Temporary Assistance for Needy Families (TANF), the Supplemental Nutrition Assistance Program (SNAP, formerly Food Stamps), the Supplemental Nutrition Program for Women, Infants, and Children (WIC) as well as subsidies for Housing and Child Care. All rules represent 2008 law. The calculator shows how different these benefits are, depending on where a low-income family lives. For example, in 2008, a single parent with two children aged 0 and 3 with poverty level wages could have received transfer benefits ranging anywhere between $4,000 in several states and $9,200 (Connecticut) if she participated in TANF, SNAP, and WIC. In addition, she could have received about $6,700 in federal tax credits and either owed state income taxes or received additional tax credits. For example, in Alabama her state tax bill would be over $300 while in Connecticut she would owe no states taxes. She would also have owed almost $1,300 in the employee side of payroll taxes. We assume her childcare costs, before subsidies, would increase to about $250 per month – some of which could be offset by childcare subsidies. Together, taxes and transfers could have changed this mom’s income from $17,000 in wages to between $27,500 and $32,000 in income and benefits, depending on where she lived. What happens if that mom gets a job? 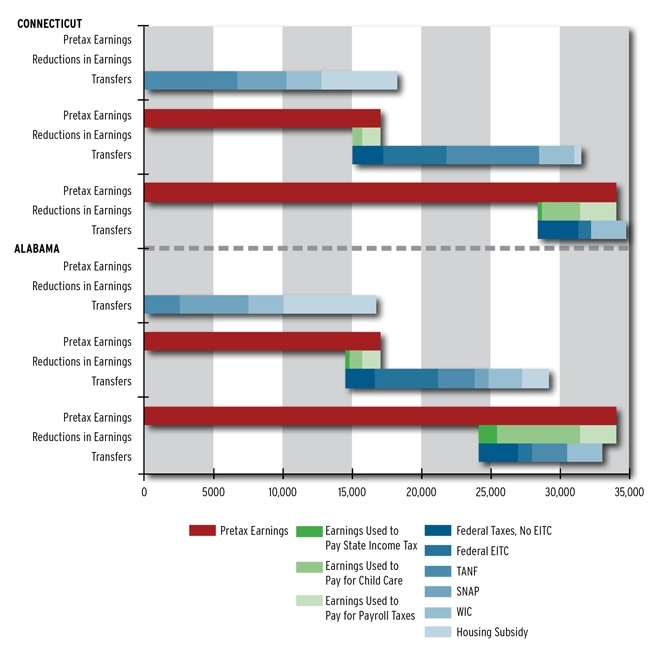 A single parent in Connecticut with two young children could have received over $18,000 in transfer benefits if she had no earnings and no income, assuming her pre-subsidy rent was $600 per month. But suppose her earnings increased to $17,000 (poverty level) – spread evenly throughout the year – increases in childcare costs (assumed to be $250 per month before subsidies) and payroll taxes would have reduced her earnings by almost $2,000. Income tax credits and transfer benefits would have then added $16,500 – for a total net income of almost $33,000. If her income increased to twice poverty, she’d have to pay almost $5,600 in subsidized child care costs, state income taxes and payroll taxes. She’d receive about $6,400 in tax and transfer benefits – for a net income of $35,000. Thus, doubling her wages from $17,000 to $34,000 resulted in a net change in income of only about $2,000. In contrast, the same family in Alabama could have received almost $17,000 in transfer benefits if the parent had no earnings. If her earnings increased to poverty-level, she would have spent over $2,500 on childcare, state income taxes, and payroll taxes, while transfer benefits and tax credits would have decreased to under $15,000. In total, the family’s net income would rise from almost $17,000 to $29,000. If her wages doubled, the combination of declining transfers, increased taxes, and higher childcare costs would have resulted in a total net income of $33,000 – an increase of about $4,000. The NICC provides a powerful tool to understand both how states differ with respect to taxes and transfers, and to understand how a family’s income changes as a parent increases her earnings. Try it out.